WhatsApp Web for iPhone/iOS : WhatsApp is an messaging app which is capable of sending text messages, images, videos, audios, allowing calls and lot more instantly. WhatsApp Web really makes the use of Whatsapp more convenient which gives instantaneous notification alerts as they are received on your phone by setting the service in your Internet browser and providing you with extra features. 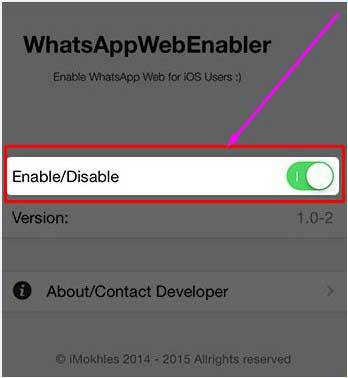 So, Carefully follow this guide to enable WhatsApp Web for iPhone or iOS all kind of devices. When WhatsApp Web was introduced by WhatsApp, iPhone or iOS users felt a bit disappointed as they weren’t able to use it because it worked only for Android,Blackberry and Windows phone users. No more of disappointment, WhatsApp has launched its WhatsApp Web for iPhone or iOS users and it is not only for iPhone or iOS users but also for Safari on the Mac. Check below for the step-by-step process of how to get WhatsApp Web on iOS/iPhone. Best Competitor for WhatsApp – Soma Messenger Download. All iPhone users like iPhone 6, iPhone 4, iPhone 5/5c, iPhone 6, iPhone 6 plus, iOS 8.3/8.4, iOS 8, iPhone 5S, iPhone 4s and all other iPhone/iOS versions and latest iOS 9 users also follow this peculiar guide to use WhatsApp Web client mode. WhatsApp Web free download on iOS/iPhone will attract huge number of other app users to this WhatsApp. Already WhatsApp stood as best chit chat messenger among all it’s competitors. WhatsApp already crossed millions of active users. Now This amazing WhatsApp Web for iPhone is officially released So, You can imagine rise in the active users of whatsapp. For now let’s begin our tutorial of How Enable/Activate of WhatsApp Web for iPhone/iOS all devices. Before Jump Into 100 % secure process of whatsapp web download on iOS you may like to look at procedure to use WhatsApp without Mobile Number. 1. First open settings in your WhatsApp and search for WhatsApp Web on iPhone/iOS whether it is available or not. 2. If it is there, tap on WhatsApp Web option and go to web.whatsapp.com from your Internet browser( Safari-Mac/Google Chrome/Mozilla/Microsoft Edge – Windows 10 or Other) on PC/Laptop. 3. A QR code will appear on the screen in your browser of PC/Laptop and the app launches a QR code scanner giving the way of scanning. 4. Just turn your phone’s camera towards the QR code on the screen of your PC/Laptop. 5. 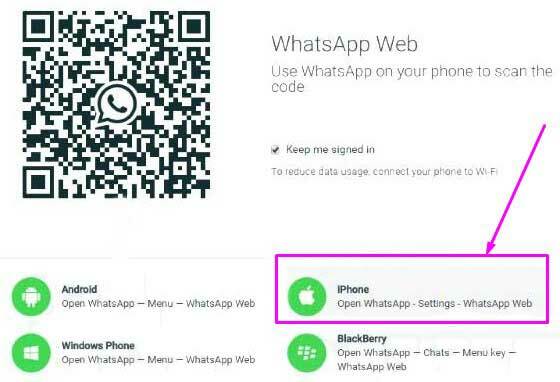 Once you scan the QR code, you will be able to login into WhatsApp on the web using your iPhone. 6. You have successfully got WhatsApp Web on your iPhone and you can use its features happily. Heya Check it : WhatsApp Web on Edge/Spartan Browser. 1. You can mute an individual chat and mark a conversation as read or unread. 2. WhatsApp Web on iPhone/iOS can give you more control over chats and group conversation. 3. Location sharing and videos can be easily backed up. 4. The WhatsApp Web interface allows the users to carry out WhatsApp chats via a desktop or laptop but things were in a basic way. 5. Editing profile photos, status message and a few small UI changes are allowed. 6. The settings icon now provides access to options like deleting and archiving on-going chats and exiting from the group chats. Must Check : WhatsApp Apk Download for Samsung Devices . Dear iOS/iPhone WhatsApp users say good bye to your depression about WhatsApp Web and start enjoying WhatsApp Web for iPhone or iOS on larger screens. If you already using WhatsApp Web on iOS platform please share your thoughts about this latest WhatsApp Web Release with our blog users. lenovo a6000 plus latest android update My WhatsApp is also not showing contacts name & notifications after the update.